Cyprus (Greek: Κύπρος, Kýpros; Turkish: Kıbrıs), offeecially the Republic o Cyprus (Greek: Κυπριακή Δημοκρατία, Kypriakí Dhimokratía; Turkish: Kıbrıs Cumhuriyeti) is a Eurasian island kintra in the eastren pairt o the Mediterranean Sea. It is the third maist muckle island in the Mediterranean. The northren pairt o the island haes been unner the owerins o the Turkish airmy syne 1974 efter they invadit the island. This haes meant that a northren seperatist regime haes cried itsel the Turkis Republic o Northren Cyprus houaniver this haesna been offeecially recogneesed. 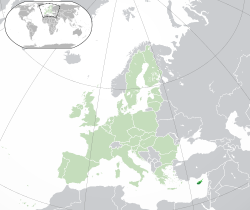 Cyprus haes been a member o the European Union syne 2004. ↑ United Nations, Department of Economic and Social Affairs, Population Division (2011). "World Population Prospects: The 2010 Revision, Highlights and Advance Tables (ESA/P/WP.220)" (PDF). New York. p. 80. This Europe-relatit article is a stub. You can help Wikipedia by expanding it. This page wis hintmaist chynged oan 20:03, 7 Mairch 2015.